When Walt Disney Animation Studios’ Moana hit screens in 2016, it immediately connected with audiences of all ages. Directors Ron Clements and John Musker had found a story rich in Polynesian culture that was also daring, funny, dramatic and powerful. Moana, which follows the ambitious plans of the titular young girl (voiced by Auli'i Cravalho) who leaves her island paradise in search of the demigod Maui (Dwayne Johnson) to help her in her quest to save her people, was heavily praised for its 3D animation and effects. Much of the film is set on the ocean, an environment that would need to be simulated in high detail - all the way from calm seas to more powerful storms, and even to appear as a watery character. Other effects simulations would also be necessary to tell the film’s story, including those relating to the powerful volcanic demon Te Kā, and the eventual awakening of the goddess Te Fiti. In this article, members of the effects animation team from Walt Disney Animation Studios outline how they delivered the water and other effects requirements for Moana, using tools such as Houdini and other custom-made software. Faced with the various water simulation and effects challenges, Walt Disney Animation Studios set out to write its own in-house proprietary water solver. This became known as ‘Splash’ and was integrated directly into Houdini’s DOP context. The studio also created a fully renderable library of effects assets - dubbed ‘Foundation Effects’ - designed to help manage the complex nature of the water requirements. “These effects assets were visible in a lightweight GL representation by all departments,” says head of effects animation Dale Mayeda. An immediate challenge for the team lay in the shoreline water and effects surrounding the islands of the Pacific Islands depicted in the film. This would require simulations for waves crashing on beaches and reefs, foam, sand interaction, and wet sand map generation. “A dedicated rig contained elements generated in SOPs, POPs, DOPs, and even COPs for the wet sand maps that were derived from the shoreline simulation,” explains lead effects animator Erin Ramos. Breaking waves of various sizes, depending on the shot, were simulated in Houdini using the Splash solver within DOPs, or generated using a procedural method in SOPs with layers of Flip particles on top. Selling the right intensity of the breaking waves on the reef was crucial, as this is an early obstacle to Moana leaving her home island. Once Moana sets sail on a previously hidden camakau, Walt Disney Animation Studios needed to deal with boat wake. “In order to handle the 350-plus shots of Moana out on the open ocean, two of our effects leads, David Hutchins and Blair Pierpont, developed an automated procedural boat wake rig,” states Mayeda. “We set out with the goal of creating a rig that would be fully automatic, triggered by upstream departments (layout or animation) publishing their work,” says Hutchins. The rig was authored in Houdini and distributed as a Houdini gallery, which meant that users could modify the networks if required. Some open ocean shots had close-up views of water interaction with the boat; for this, effects artists relied on a drips and sheeting water element on the surface or bubbles underwater. Effects animator Alex Moaveni explains how that worked. In a typical shot, the boat animation would be dealt with first, after which the water simulation would run. This process was reversed if the motion of the water needed to affect the animation (an example is when Moana is on the boat and a lava bomb hits the water nearby, pushing the water, and therefore needing the boat to react accordingly). In those instances, artists switched from the shot being ‘animation driven’ to ‘effects driven’. Moana’s decision to leave the island is somewhat aided by a water character that had a distinctive personality (it had even greeted her in the shallows when she was a toddler). This character was made possible via close collaboration between the animation and effects teams, after a character rig had been established for layout to place and pose in shots. Animation then worked on timing and shape language before effects would handle the dynamic components of the character. Frost adds that a collection of rigs was developed for the water character. In calmer moments, for example, effects used a more procedural approach with noise functions and internal bubbles. The water character was, of course, connected to the wider ocean, and the effects team had to ensure it was not just a “tenticular form protruding from the water, but something that was part of the ocean as a whole,” notes Frost. Although geometry seams were able to be closely matched, Frost says separate surfaces were still apparent in renders. But, by converting meshes to VDBs, the team could rely on its proprietary levelset compositing workflow. In a final confrontation with Te Kā, the ocean parts to form a massive water wall. The scene is reminiscent of an earlier one in which a wall is formed around Moana as a toddler. For the effects team, this involved two steps - the parting, and then the formation of the liquidy surfaced wall of water. 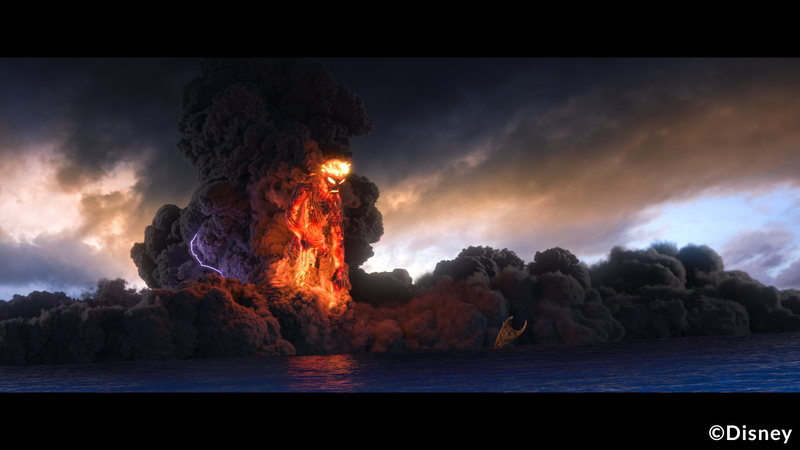 The ocean parting sequence follows a large-scale battle sequence between the volcanic demon Te Kā as it attacks Maui and Moana. For over 100 shots, the effects team simulated masses of lava, fire, lightning and pyroclastic plumes on and around Te Kā. 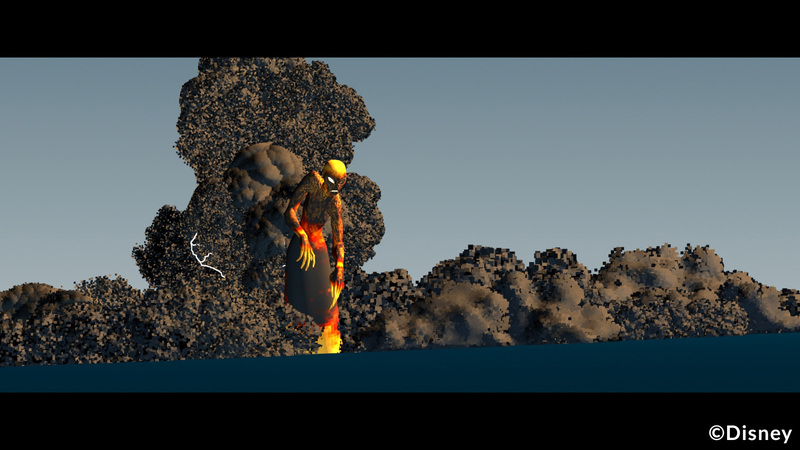 Fire and flowing lava emanate constantly from Te Kā’s body - these effects were handled procedurally in Houdini, which meant they could generally be automated. “Using some of Houdini's built in contexts like CHOPs, our effects could automatically react to the character animator’s choices,” says effects animator Nathaniel Sims. As an active volcanic demon, Te Kā also exhibits hints of lightning strikes, which also illuminate smoke plumes. Two variations of lightning were simulated by the effects team. Realising Te Kā is in fact the goddess Te Fiti, Moana restores the creature’s heart and transforms her back to normal. The actions lead to a sequence showing the healing of Te Fiti and the healing of the surrounding ocean and island environments, especially vegetation. The DOPs framework in Houdini was used here, and was built to be compatible with existing solvers to take advantage of native particle and RBD collisions, relying on POP grains for constraints. But perhaps the most striking aspect of all the effects simulations that were carried out is that they each serveD to take the story forward. And what a story it is.